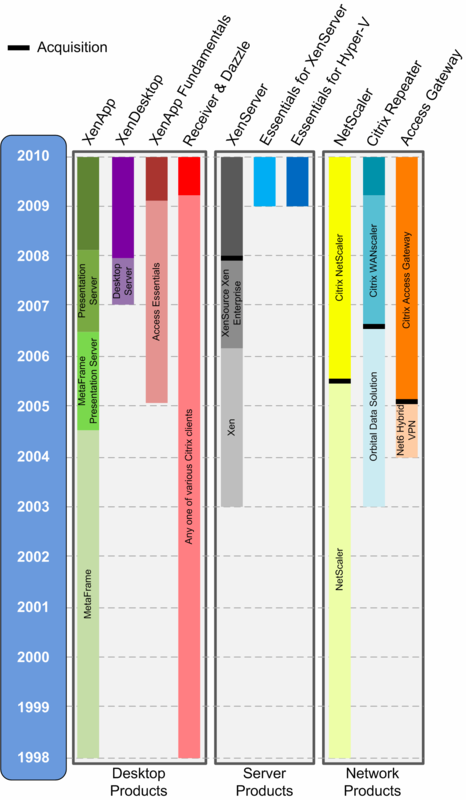 As we reach the end of 2009, I wanted to take a look at the Citrix product landscape as it sits today. As we reach the end of 2009, I wanted to take a look at the Citrix product landscape as it sits today. We receive many requests to outline what Citrix is up to, as well as for some sort of correlation between the current product names and their historical names. In June of 2007, we published our first rundown, which also explained the many internal Citrix product groups and the products they are responsible for. Those internal groups have gotten even more confusing as time has gone by (and therefore less useful to us as consumers), so in Spring, 2008, we published an article detailing Citrix's products and external product groups as the were re-aligned after the XenSource acquisition's dust had settled. Eighteen months later, a look at the landscape shows that things haven't changed as drastically, but are different enough to warrant another look into Citrix's product line up. 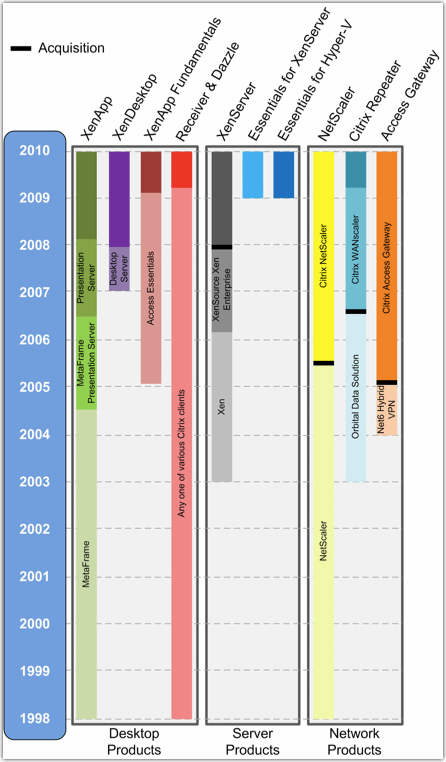 This time, however, we've also put together a chart that shows the lineage of all the current Citrix products, which currently takes us back to the release of MetaFrame 1.0 in 1998. Citrix has divided their products into two groups: Citrix Delivery Center and Collaboration Products. The Citrix Delivery Center group contains most of the stuff that we deal with every day, while the Collaboration Products group contains what used to be Citrix Online Services. The Citrix Delivery Center group is broken down into three sub-groups: Desktop Products, Network Products, and Server Products. Let's take a look at the products under each group. The collaboration group consists of all of Citrix's online products, including the things you see commercials for on TV now. Because of the ads, many non-IT people come up to me now and say "Isn't that 'Go To-something' what you do?" Until today, the easiest thing to do is say "Yes." Now you can just hand them this article! Once upon a time, the product editions were simple - you either had Enterprise, Advanced, and Standard. Then, Citrix introduced Platinum and got rid of Advanced. Now, some products have Standard, and some have another low-end edition. It's like going to the movies...extra large, large, and medium sodas. I'll spare the Seinfeld routine, but it ends with lots of head shaking. Platinum - fully-loaded version, Platinum contains every XenDesktop feature that's offered, including all the features of XenApp Platinum and XenClient when it comes out. Enterprise - everything Platinum has except Edgesight monitoring, single sign-on, Advanced Access Control, SmartAuditor, and IntelliCache. XenApp features are that of XenApp Enterprise, not XenApp Platinum. VDI - consists of only core XenDesktop features, provisioning services, and profile management. No XenApp or XenClient features will be available. Enterprise - This thing does pretty much anything, and competes directly with the other SSL VPN solutions on the market today. If you're a server person getting this, your network team would like a word with you. NetScaler comes in three editions; Platinum, Enterprise, and Standard; as well as a virtual appliance (NetScaler VPX), but since it's mostly out of the scope of desktop and application virtualization, I'll just refer you to the feature comparison. It was surprisingly hard to find some of the dates these things happened, especially the name changes, so I took a few guesses. If I'm way off, let me know, but I figure as long as I get the line in the right half of the year, I'm be happy. Click on the image for a much larger, easier to read one. "While [an SSL VPN is] most likely what Citrix went shopping for initially, I think the VoIP and application transformation stuff has the greatest potential to shape Citrix’s future." "As I said, I think Net6’s work in the IP Telephony space really shows how Citrix is thinking about the future. Citrix is making it clear that they view voice and data in the same way. To them, voice is just another part of the 'any' access." It's all funny in hindsight (and it was Brian's suggestion to bring that up), but does anyone know if Citrix EasyCall has anything at all to do with the VOIP Gateway that they acquired from Net6? Last, as I was writing this, it occurred to me that there's been a lot of changes from all the big vendors over the past year or two. With that in mind, I think it's time we did one of these for each of the big vendors in our space. In the future, look for product rundowns for VMware, Microsoft, Quest, and Symantec (that one will be fun). What's behind the Citrix XenServer surge? Wow! Is the Access Gateway really the product that Citrix currently sells that's gone the longest without a name change? With XenDesktop, didn't Desktop Server 1.0 come up before PortICA (Desktop Server was essentially a RDP to ICA Broker wasnt it)? It references a blog post (with a bad link) that Jeff Muir wrote in 2006, which is prior to CDS being announced, which took place in Q2 2007. If it's any consolation, they did change the look of the device a time or two since its release. I believe ours is so old it has the Net6 logo scratched out with "CAG" written in Sharpie. What about VideoFrame, Password Manager, and that awesome pile of dog poo MSAM ! Can we stretch out the chart to put Winframe in there somewhere? No more name changes for 5 years, people. Stop picking at it, you'll just make it worse. Seriously. Can somebody fire their marketing department yet? I mean, I even think the current names are OK, but I can't really tell because I'm so dizzy. Nice job! Great chart! Only a little cloud somewhere in the background and it's complete. ;) Just kidding! Looking forward to the Symantec product chart. That would certainly be helpful! I wouldn't necessarily say that the NetScaler is "out of scope" While yes, it's optimizes and load balances web traffic. Citrix is really starting to leverage the NetScaler as their edge point device for XenApp and XenDesktop, with CAG and Web Interface running directly on it. I saw a presentation and white paper last week with Wyse terminals external to a organization having apps delivered via SSL offloading PNagent thru the NetScaler. Personally, I think the NetScaler is one best products Citrix has that no one talks about! Yeah- I'm with Koolhand: enough! Enough "mexican food-style marketing" (it's all the same stuff repackaged/remarketed! Citrix Desktop Server came first, this was the RDP double hop solution but in the background we were working on the ICA stack (portICA) that then went into Desktop Server v2. PortICA was never a product release it was just a component name to describe the concept of a "portable ICA stack". E.g ported from a TS server OS to a non TS workstation OS. On a seperate note you could say that the Access Gateway line originally started with the software Secure Gateway,. ...I'll admit to not have used either, so maybe I am being picky? Ok, I'll pull out PortICA since it was just an internal code name. I don't want to get in to a chart that covers all of those! I actually find the chart concept pretty handy, and if anyone can come up with something better, send it my way and we'll post it up. If I'm going to do one for Symantec, I think I'll need all the creativity I can get! As I do these other rundowns, we'll see a lot of that. That's why the Symantec one will be challenging. There's a lot of acquired technology there. Funny to see how much technical people are attached to a simple product name... As much as marketing people are trying to change it ! Simple question : is it not a sign of a problem to evolve or change which could cause some trouble regarding the capacity to adapt the entreprise to change ? Good information. Your chart is correct, but Branch Repeater was not "formerly the Citrix WANScaler hardware appliance" as you stated in the article. Citrix Repeater was formerly known as WANScaler; Branch Repeater was formerly known as nothing because it didn't exist.